When it comes to coastal holidays in the UK, knowing the best place to get fish and chips is vital! Fish and chips are one of Britain’s favourite dishes, and there is nothing better than tucking into a vinegary, salty serving of chips and battered cod while looking over the sea. If you are in the search for a place to stay in the south of Devon, particularly any Dawlish hotels near the beach, Langstone Cliff is the perfect accommodation, close to the beach and several of the town’s best places for fish and chips. 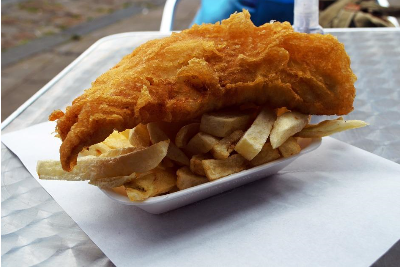 Chippy Chaps, located on Beach Road in Dawlish Warren, has a 4.5-star rating on TripAdvisor, noted as being one of the best in the area. With reasonable prices, tasty food and friendly staff, you can see why this chippy is a go-to for locals and visitors alike, with many reviews calling it ‘perfect’ and the ‘best chippy in Dawlish’. There are also some extras on the menu with a favourite being their banana fritters. Be prepared for a bit of queue when you visit, but that is just a testament to the quality of the food and service. Rated four stars on TripAdvisor, Rock ‘n’ Sole Fish Bar can be found on Strand Hill in Dawlish. Top reviews mention the friendly staff, fresh food with decent portion sizes and good prices. There is a variety of food on the menu including kebabs, fish cakes and battered sausages, so if a traditional fish and chips are not to your taste, there are plenty of other options to try. On Queen Street, you will find Chips A’Hoy, one of Dawlish’s best-rated fish and chip shops with four stars on TripAdvisor. Open for lunch and evenings from Tuesday to Saturday and evenings on Monday, you can eat in, or takeaway and orders are ready quickly. Portions are generous, and service is great. With many reviews mentioning the tasty food, of which includes more than fish and chips! You may find yourself on a few return trips during your stay in the town. Head to Warren Road in Dawlish Warren for some top quality food from Penaligons Plaice. The friendly service, combined with a clean setting and great fish makes this chippy one of the most popular in the area. The food is often cooked fresh and to order, so though there is a bit of a wait, it is worth it! The menu is varied, catering well to different needs such as vegetarians and children’s appetites, all at reasonable prices. With several five-star ratings on TripAdvisor, Penaligons Plaice is one to check out when on holiday to the South Devon coast. Have you been to these places when you visited Dawlish? We’d love to know if you agree with our choice of favourite chippies! Be sure to check out our blog for more tips on places to see and things to do around Dawlish.